"Sekondi" redirects here. For the constituency, see Sekondi (Ghana parliament constituency). Top left picture: Arterial road and highway with the Sekondi-Takoradi Stadium, First top right picture: Shoreline of Sekondi-Takoradi, Second top right picture: Railway station of Sekondi-Takoradi, Bottom picture: Sekondi-Takoradi harbour with intermodal containers and private housing estates. 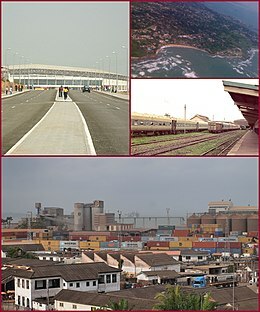 Sekondi-Takoradi, a city comprising the twin cities of Sekondi and Takoradi. 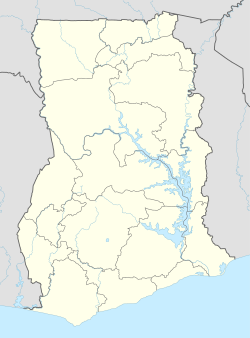 It is the capital of Sekondi – Takoradi Metropolitan District and the Western Region of Ghana. Sekondi-Takoradi is the region's largest city and an industrial and commercial centre, with a population of 445,205 people (2012). The chief industries in Sekondi-Takoradi are timber, cocoa processing, plywood, shipbuilding, its harbour and railway repair, and recently, sweet crude oil and crude oil.The fundamental job in Sekondi-Takoradi is fishing. Sekondi-Takoradi lies on the main railway lines to Kumasi and Accra. 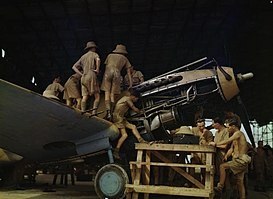 The Desert Air Force, 1943; Royal Air Force (RAF) airmen in tropical dress work on the Allison V-1710 Aircraft engine of a Tomahawk aircraft in a makeshift hangar. The photograph is believed to have been taken at RAF Takoradi. Sekondi, older and larger, was the site of Dutch Fort Orange (1642) and English Fort Sekondi (1682). It prospered from a railroad built in 1903 to hinterland mineral and timber resources. Takoradi was the site of Dutch Fort Witsen (1665) and has an important deepwater seaport, Ghana's first, built in 1928. During World War II, RAF Takoradi was an important staging point for British aircraft destined for Egypt. Spitfire fighter planes were shipped in crates from England to Takoradi where they were assembled then flown via Nigeria and Sudan to the war in Libya. 26 Squadron SAAF was also based in Takoradi during World War II flying anti-submarine and convoy protection patrols over the Atlantic. A number of South African airmen are buried in the Takoradi European Public cemetery. The cities combined in 1946. On 20 November 1969, the city became the seat of the Roman Catholic Diocese of Sekondi–Takoradi. The city is currently named (although not officially) as the Oil City of Ghana due to the massive discovery of oil in the western region and has attracted massive migration from people all around the world. For example, of the 248,680 people in the Sekondi-Takoradi metro area in 2010, only 92,000, or well under half, were born in the Western Region of Ghana. 60,000 came from the central region of Ghana, centered on Cape Coast and just to the west of Sekondi-Takoradi. 20,000 from the Ashanti region centered on Kumasi, and 20,000 were born in the Greater Accra Region. Sekondi-Takoradi's population is overwhelmingly Christian. 35% of the region are Pentecostal/Charismatic, 26% are Protestant and 14% are Catholic with the remaining 12% comprising numerous minor denominations. 9% of the population are Muslim, 3.5% identify as non religious and 0.2% practice traditional African religions The major ethnic group found in Sekondi are the Ahanta people. Takoradi is also a port city and has timber, energy, and technology industries. Over the years it has attracted a good number of investors, including miners, as the city is close to the mining towns in the western part of Ghana. Sekondi-Takoradi has plenty of beaches, however they are not a major tourist attraction. Many beaches are also found to the west of Takoradi, with small resorts such as Fanta's Folly, The Hideout, and Green Turtle Lodge with larger ones such as Busua Beach, Lou Moon Lodge and Axim Beach Resort and also amazing places to eat such as Paragon Bar and Grill. It also has an annual street carnival, which is popular with tourists. There is also the village of Nzulezu which is a popular tourist site, in the Western Region. Archbishop Porter Girls Secondary School and many others. Takoradi Technical Institute houses a fab lab, equipped by the Massachusetts Institute of Technology (MIT), which is the first of its kind in Africa. Takoradi has a well-equipped technical training centre (Takoradi Technical Institute, TTI, 1,400 students in two shifts) assisted by the German government through GTZ/GOPA. 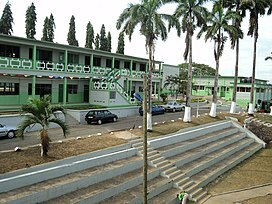 Apart from TTI, Takoradi has a polytechnic and other renowned secondary schools including Ghana Secondary Technical School, St. Mary Secondary School, Bompeh Secondary School, Takoradi Secondary School and many others. Sekondi-Takoradi has many internet cafés and computer training centres to encourage familiarity with computers and acquire computer skills. The Western Regional Library was established in Sekondi in 1955. Beach on Virgin Island in Sekondi-Takoradi. Aerial view of Takoradi Harbour. 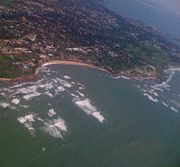 Aerial view of the Sekondi-Takoradi Shores. Commuters on street in Sekondi-Takoradi. 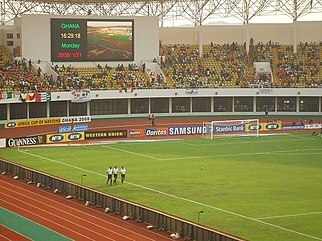 Wikimedia Commons has media related to Sekondi-Takoradi. ^ a b "World Gazetteer online". World-gazetteer.com. Retrieved 8 February 2014. ^ a b c "Private Tutor". Infoplease.com. Retrieved 8 February 2014. ^ Nancy Lawler (2002). "Soldiers, Airmen, Spies, and Whisperers: The Gold Coast in World War II". Ohio University Press. ISBN 9780821414309. Retrieved 8 February 2014 – via BiblioVault. ^ "South Africa War Graves Project". Southafricawargraves.org. 8 October 2011. Retrieved 8 February 2014. ^ Obeng-Odoom F., 2014, Oiling the Urban Economy: Land, Labour, Capital, and the State in Sekondi-Takoradi, Ghana, Routledge, London. ^ "Sekondi-Takoradi Masqueraders Street Carnival". CNN iReport. Retrieved 2 September 2016. ^ Darko, Kwaku. "30 magical pictures of Nzulezu that will make you want to visit". OMGVoice. Retrieved 19 April 2018. ^ "Klimatafel von Takoradi (Sekondi-Takoradi) / Ghana" (PDF). Baseline climate means (1961-1990) from stations all over the world (in German). Deutscher Wetterdienst. Retrieved 18 October 2016.